Happy Earth Week! We hope you’ve had a great holiday and are enjoying the springy weather here in NC. 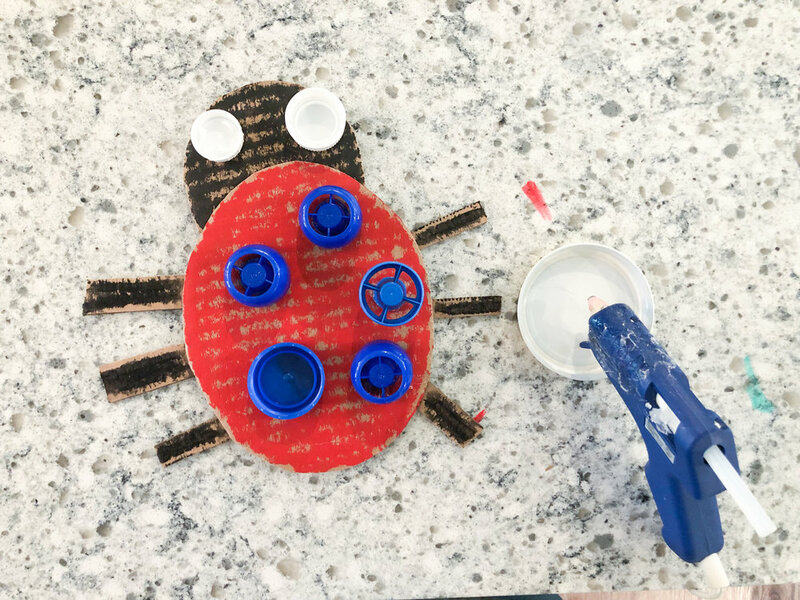 Today we are sharing a great craft to use up some recycled materials and get into this month’s Kid Lab theme - BUGS! These recycled bugs are easy to make and customize to make them uniquely yours. Step 1: Cut out two circles from your cardboard, one larger and one smaller. Also cut out 6 long, thin pieces to be the bug’s legs! Insects have 6 legs. Step 2: Use your paint sticks (or paint) to paint the cardboard pieces. I made the bug’s body red and the head and legs black. You can make your bug any colors you want! Step 3: Use your hot glue gun to glue the cardboard pieces together. Glue the smaller circle at the top of the large one and glue three legs on each side. Next, glue your bottle caps and lids to the bug’s body to create spots! We used all blue caps here, but again you can use any color! Choose two bottle caps to be the eyes and glue them to the head. Step 4: Add details by gluing two pipe cleaners to the top of the head to become antenna! Curl them around your finger or bend them at the top. You can also add some pom poms. We glued on pom poms to create more spots and glued them onto the eye bottle caps to give the eyes a center dot! We hope you can find some time to enjoy making your own recycled critters at home! What other kinds of bugs can you create with recyclables? See what you can come up with and share them on Instagram with @kidlabraleigh - we’d love to see! Hi, it’s Grace here! I wanted to share some of what we’ve been up to at Play Lab this month. We’ve had such a great time exploring March’s theme: Human Body. Last weekend’s Play Lab in particular was such a fun testament to Kid Lab flexibility. Sometimes, you plan on exploring the human body indoors- and Saturday morning is a gorgeous, sunny day - so you go outside! Playing with water beads (red blood cells!) out in the sunshine. Looking at books and posters on the porch. When the kids lead the way, it’s amazing the new ways they find to learn. We went out to the garden and explored some of the newly blossoming beds and realized that being curious about where our food comes from is a way of discovering ways that the human body is nourished! We even discovered some carrots! As the weather warms up, I can’t wait to see all the new avenues for curiosity as kids explore our outdoor spaces. We’re so excited to dive into April’s theme and hope y’all will join us! Hello everyone! 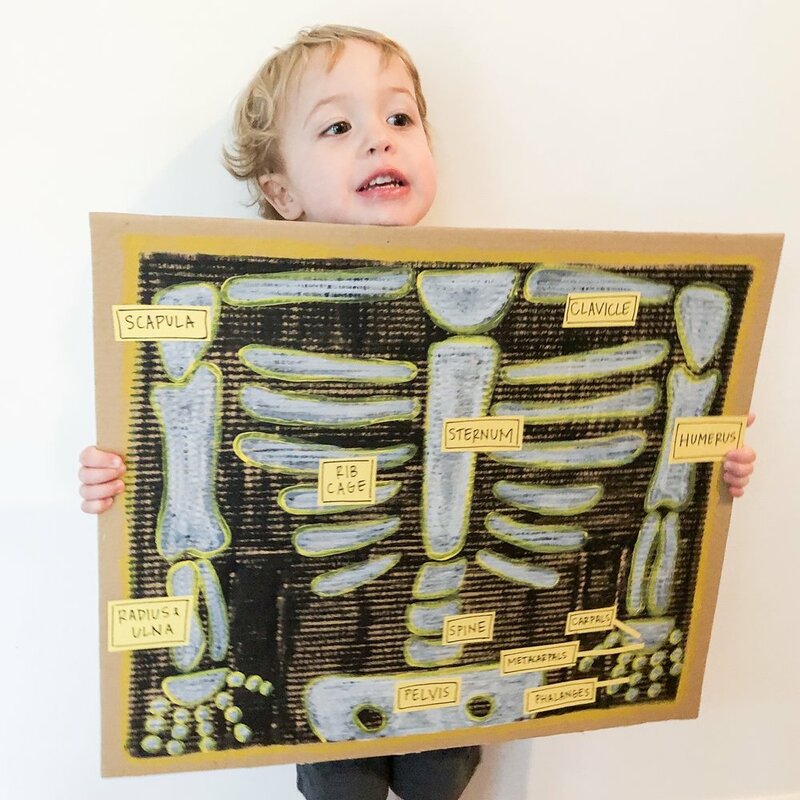 I’m so excited to be back with another at-home craft you can make with your kids to learn all about this month’s theme - the human body! Human body science has always been some of my favorite science to teach. It’s always such a fascinating subject for kids! As O and I were talking about the human body together this month he asked so many questions about bones. That inspired this craft - a DIY x ray machine! Read below to learn to make your own and to get the printable template. Step 1: Using a black paint stick (or paint) paint the entire piece of cardboard black and let it dry. I prefer to use paint sticks on cardboard this large because it helps keep the cardboard from warping as it dries. Step 2: Print the X-ray machine template. Using this as a guide, draw bones onto the cardboard. Let the white paint stick (or paint) dry and then outline them with yellow. Step 3: Use your permanent marker to write the names of each bone (found on template) onto construction paper and cut them out. Glue the labels onto the bones. Step 4: Play! This was a fun craft for us that resulted in a good bit of time spent playing doctor. 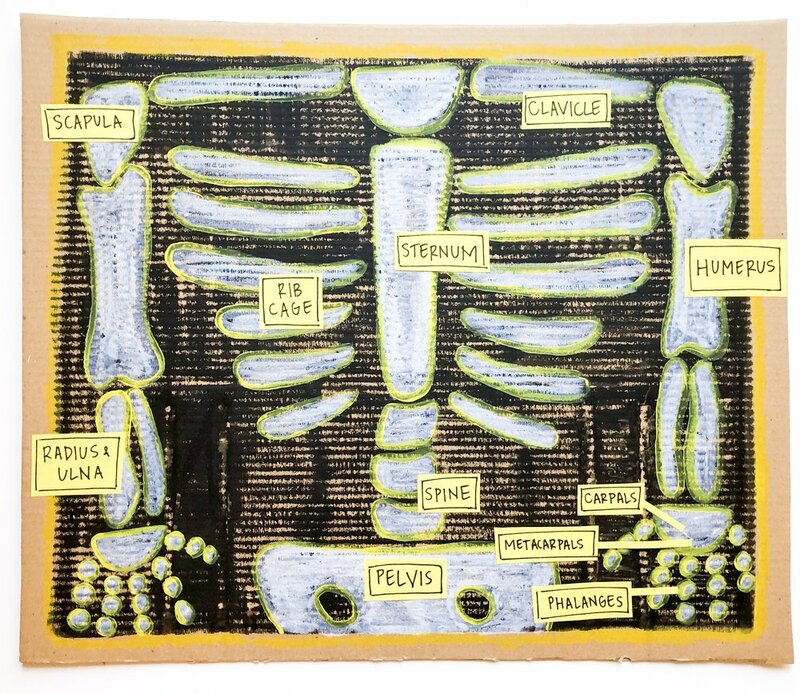 When we’re finished I think we will hang it in our playroom to keep the conversations about the human body going! We’d love to see your x-ray machines!! Share them on Instagram and tag @kidlabraleigh. Hello Kid Lab community! My name is Emily and I am excited to be here at Kid Lab to share an art project you and your kids can do at home. I am a former science teacher and mom to two kids in Raleigh, NC. 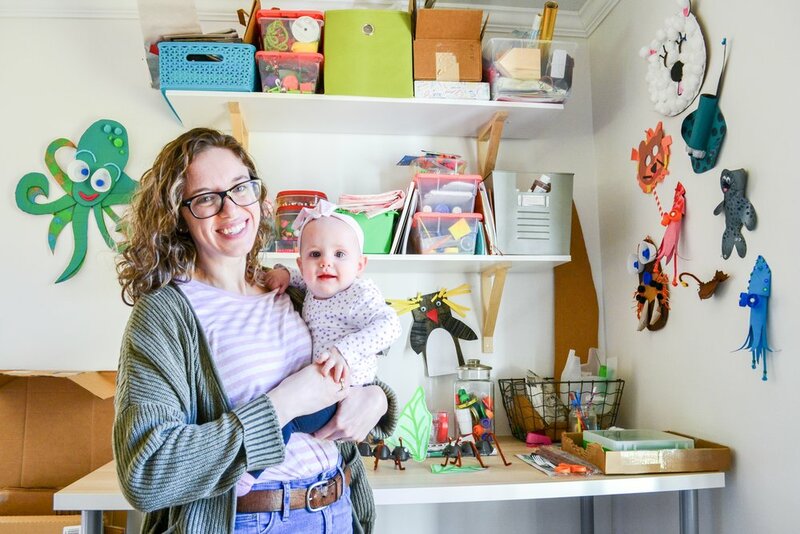 You can usually find me sharing kids crafts projects on my Instagram page, @makingwithmommy, or hanging out with my little ones at home. I have recently joined the Kid Lab team and can’t wait to see where this journey takes us! 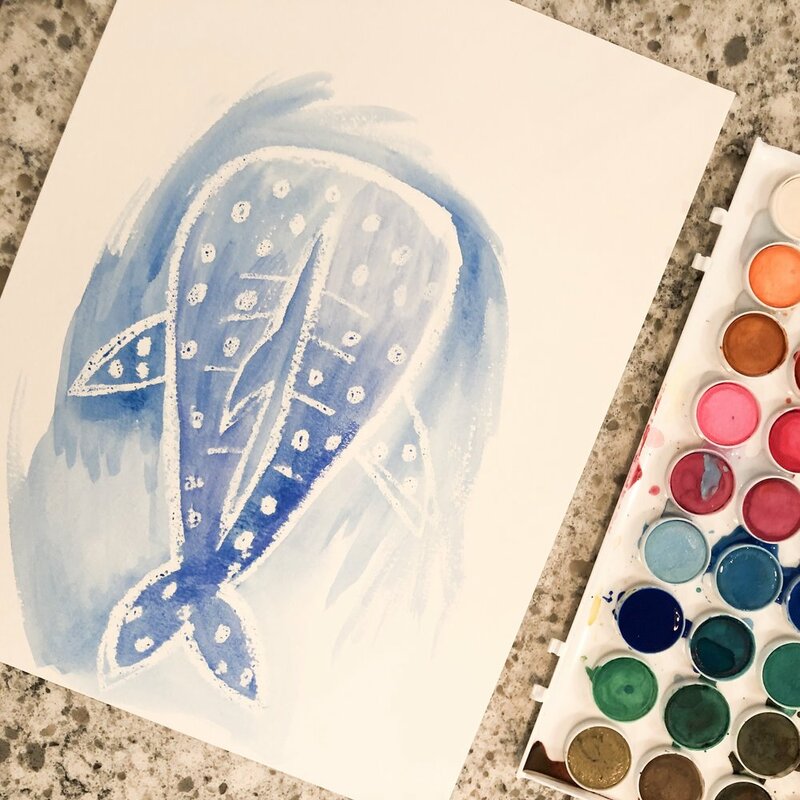 Today we are sharing a tutorial to create a watercolor whale shark. This month Kid Lab has been all about the ocean deep and this is one of the coolest animals you’ll find down there, in our opinion. Animal crafts are my son, O, and my favorite crafts to make together. This one uses an art process that we also love - wax resist painting. 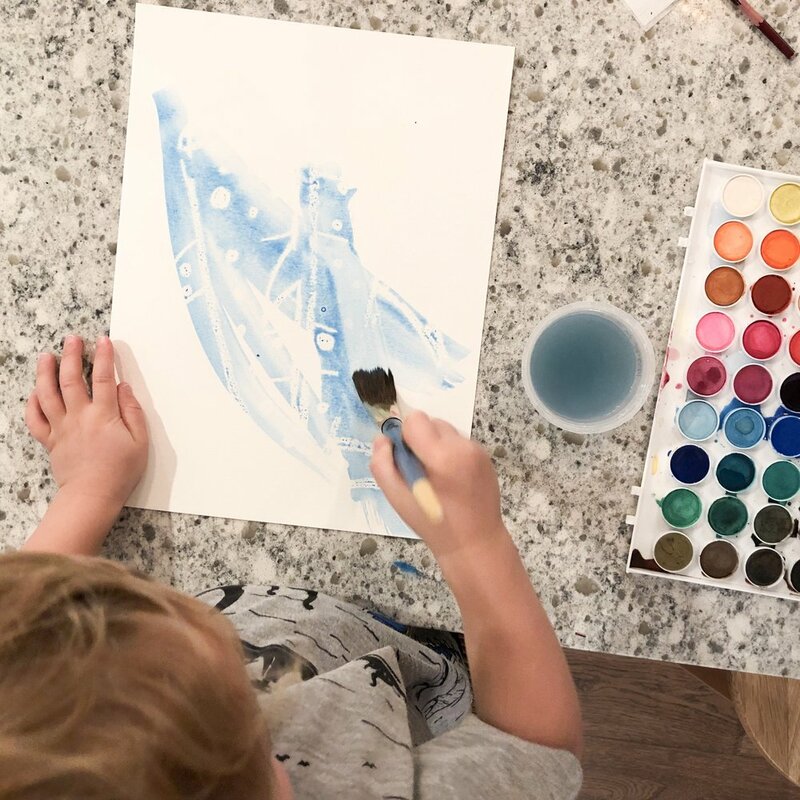 Read below for how you can create your own whale shark at home! Step 1: Draw the outline of your whale shark on your white paper with the white crayon. I do this under a light so that I can tilt the paper and check on my picture as I go! Add some dots to your whale shark with the crayon as well. 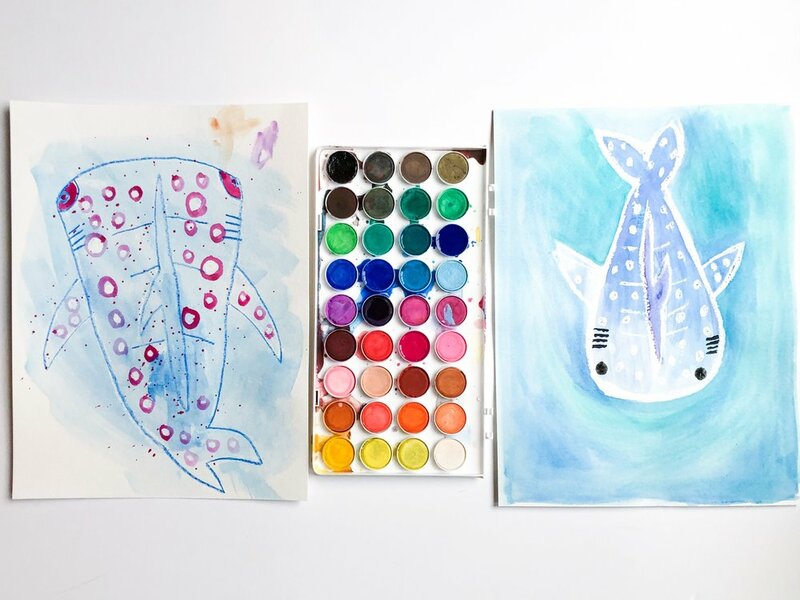 Step 2: Using a dark color of watercolor paint, paint over the whale shark drawing. You want to paint slowly and be careful not to flood the paper with too much paint - go over the drawing one section at a time. As you paint, the areas where crayon is on the paper will resist the paint and remain white! Step 3: Once your image has been revealed, add some other colors of paint to the water surrounding the shark or the shark itself! Let your watercolors dry for a minute and then add any details you like to make them pop! *Tip: When O painted his shark, he was a little heavy handed with the paint and some of the crayon lines disappeared. I traced back over the white lines with a blue crayon once the paint had dried and the image came back to life! If you create a whale shark we would love to see it! Share it on Instagram and tag @kidlabraleigh! I’ll be back each month to share an art idea you can do at home based on our monthly lab themes! Please let me know if you have ideas for types of art projects you’d love to learn to do with your kids. Leave us a comment below!